Chicken madeira is one of my family’s favorite chicken dishes to make at home. A couple of my family’s other favorite chicken dishes are Monterey chicken and Cajun chicken pasta. So I will admit, I love a good meal at The Cheesecake Factory. 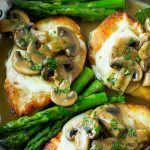 One of my favorite dishes to order there is the chicken madeira – you just can’t go wrong with golden brown chicken, melty cheese, amazingly delicious mushroom sauce and asparagus. I don’t get to the restaurant that often because the wait is always so long, so I decided it was time I learned to make chicken madeira at home. 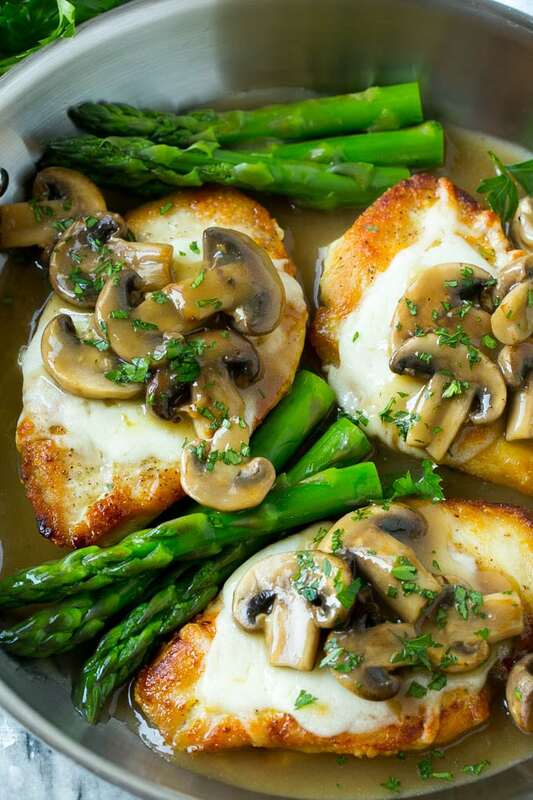 How Do You Make Chicken Madeira? This recipe starts with thin cut chicken breasts. I use the thin cut variety because they cook quickly and evenly. The chicken breasts are seared to golden brown and then set aside for later use. The next component to this recipe is the madeira sauce, which is a combination of madeira wine, mushrooms, beef broth, corn starch and butter. After the sauce is done, it’s time to assemble the dish. 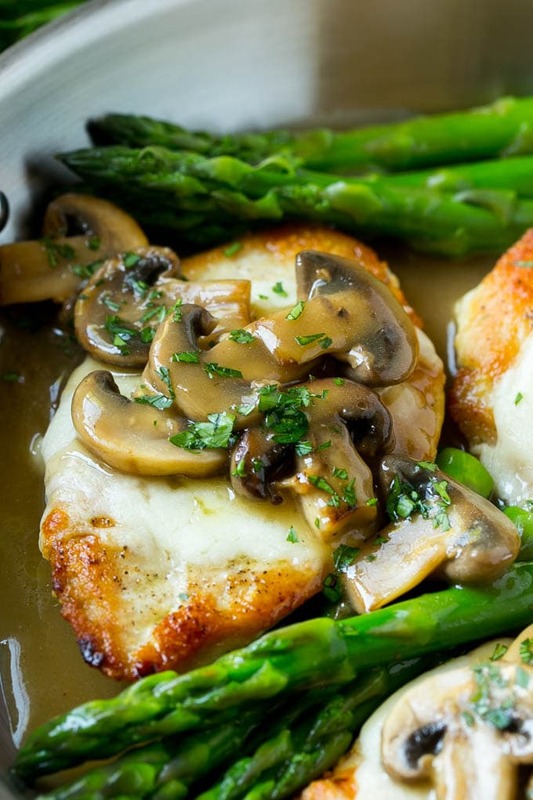 The reserved chicken breasts go into the oven with a sprinkling of mozzarella cheese and a side of asparagus spears. 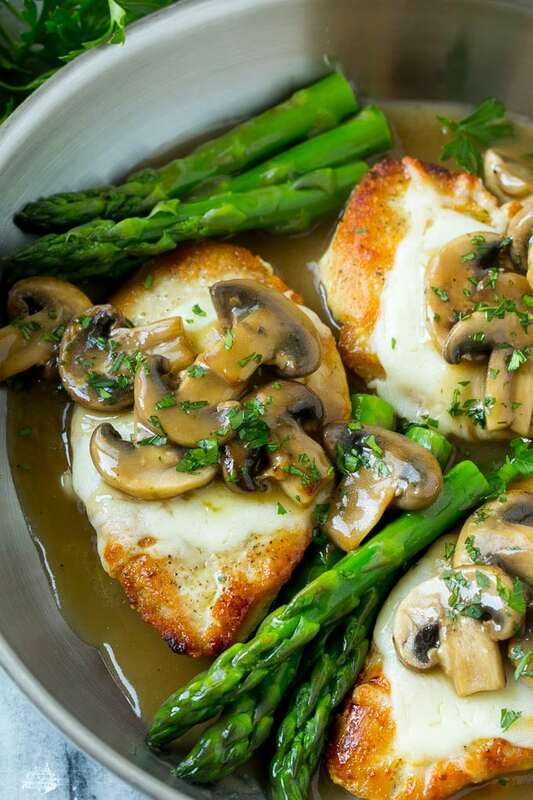 After the cheese is melted and the asparagus is cooked through, top the whole thing with the madeira sauce and serve! I like to serve this chicken madeira over mashed potatoes, but rice or pasta would also be good choices. I had no trouble finding madeira wine at the grocery store, you can check both the cooking wine and drinking wine sections to find it. Don’t skip the madeira wine here, it’s what makes this dish totally unique! This recipe is a little more work than some of the other dinner ideas I tend to share here, but it’s totally worth the extra effort and dirty dishes. It’s great for company or for a simple family dinner. Now all I need to do is figure out how to make some awesome cheesecake to go along with this for the ultimate Cheesecake Factory style experience! Where do you find your Madeira wine? Can’t find in any local grocery stores. They did have it at my grocery store in the wine section, I shop at Safeway and I found it pretty easily. Some stores keep “cooking” wines separate, sometimes near the vinegars and sauces. I made this dish and used sherry (as a sub for Madeira) because that’s all I had on hand. It was FAB-U-LOUS! Can I make this into a freezer meal? Do I need to change anything for it? You could pre-cook the chicken and make the sauce, then freeze both. You’d just need to assemble the meal by re-heating the sauce and chicken, and adding the cheese and asparagus. Hope that helps! Looks better than a restaurant meal! Is the maderia wine strong tasting in this recipe. It doesn’t taste alcoholic at all, the wine adds a little bit of depth and sweetness to the sauce, but I’m not a wine fan normally and I think it’s great! Use grape juice instead. Just make sure it’s the same color as the wine in the recipe. These look mouth watering yummy! You could try marsala wine which is similar, I haven’t tried it with other wine varieties!